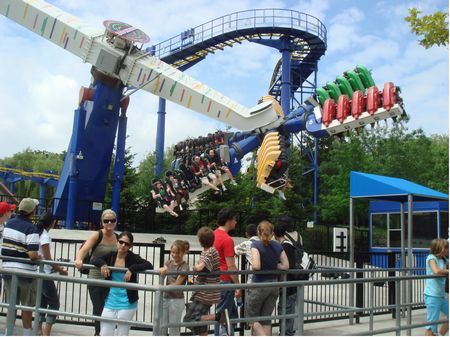 Shockwave is an excellent spinner in International Festival and one of the best attractions at Canada's Wonderland. The minimum height to ride is 54 inches. This marks the second Mondial ride installation at the park. Shockwave, a Mondial Top Scan, is an intense spinning attraction that features a ring of six pods, with five seats available in each pod. The ring is supported by a giant arm that lifts the ride off the ground. Once the ride is in the air, both the ring & the arm will spin in a counter-clockwise direction. Oh, did I forget to mention that the individual pods are free to spin 360 degrees forwards or backwards? The ride does accommodote larger guests.